Successful training programme design is the essence of every personal training business. Ultimately, that’s why your clients hire you; to tell them what to do in the gym or at home to achieve their fitness goals. A well-designed online coaching system will create a bond between you and your clients, help them understand that they need to take ownership and action to be successful and it will give them back the responsibility and control over their success. Simply paying you will not bring results or solve their problems, consistently adhering to the plan that you both agree will. In this article we will discuss how to approach programme design for weight loss goals. nutrition coaching has a massive impact on their weight loss progress, designing workouts and recommending activities that maximise the number of calories their body burns and improves their fitness is always desired with these clients. Some less educated fitpros go down a rabbit hole of recommending the latest trending workouts that are labelled with “fat burn” or “metabolic boost” to these clients. While there is plenty of evidence to suggest incorporating HIIT, for example, may yield great results, the health and safety of your client is often ignored in such one size fits all plans. Strength training for fat loss has also been researched and it is suggested that a combination of aerobic and strength training yields the best results in terms of decreased body fat mass, and improvement in overall physical function. The best plan is one to which your clients can adhere, and which works well for their specific goals and needs. This means they will need to feel challenged, but not overworked. Ideally, they should find it enjoyable and achievable. There are many ways to skin a cat, your task is to find the way that works best for each of your clients. In simple terms if you can help clients to enjoy training and fit it around the life they currently lead they are very likely to stick to the plan long term. If your plan incorporates whole body strength, intervals and cardiovascular work clients should get great fat loss results. How Often and for How Long Should Your Clients Exercise? 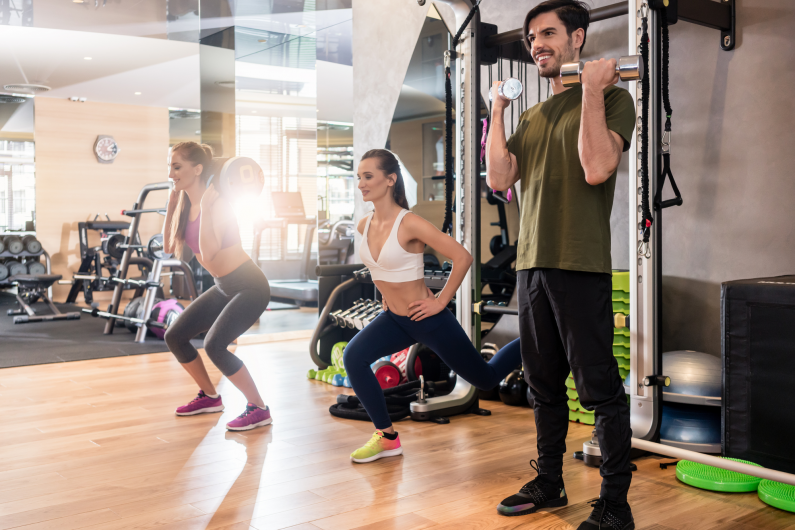 Taking into account the results of your clients’ fitness and lifestyle assessment, you will need to consider how frequently they are willing to engage in physical activities, what their preferences and challenges are and if there’s any specific exercise they are not able to perform. As a general guideline, you can turn to the NHS recommendations and take it from there: healthy adults should engage in 150 minutes of moderate aerobic exercise and work on their strength twice a week, OR, 75 minutes of vigorous aerobic exercise and 2 strength sessions a week. Most evidence suggest that training between 3 and 6 days a week provides the best results and metabolism boost for the time and effort put in to training. Looking at your clients’ activities on a weekly scale gives you the ability to offer flexibility to those clients who have a hectic lifestyle, so they can plan their sessions around their work and family commitments. When you employ a system like PT Distinction, building your clients training plans is very fast and everything is easy to understand and track for your clients. This means happy clients who understand exactly what they need to do, and you can see your clients progress to discuss their challenges, wins, and tweak targets when needed.